firmly – the sacred fire has now been burning continuously for 44 days and nights, carrying the power of all the prayer offerings that have been placed upon it. We would like to state again that all who will stand with us in prayer to honor the ancestors are welcome at Sogorea Te. If you live near the Bay Area, please consider stopping by for a few hours, or a few days. Your presence will be very appreciated. Directions can be found here. At this time we are also putting out a request for donations to cover our ongoing expenses for food, supplies, portable toilet rental, etc, as our funds and supplies are starting to run low. Donations can be made online, or checks can be sent in the mail, with an option of being tax-deductible. Food donations can also be brought to Sogorea Te at any time. GVRD is continuing to threaten possible legal/police action against the ongoing prayer vigil at Sogorea Te. We are asking all our supporters to please be on heightened alert over the next two weeks and prepared to respond to a call for emergency on-land support. 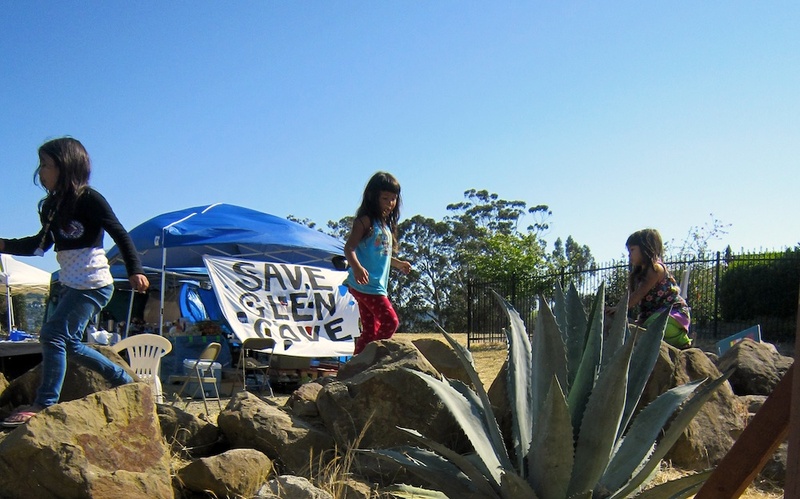 Support continues to pour in from native and non-native communities throughout California and beyond. 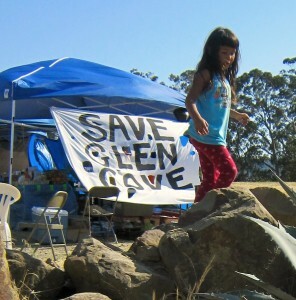 On May 24, another official tribal resolution was passed by the Pit River Tribe, in support of protecting Glen Cove from GVRD’s proposed development. Yesterday, volunteers from the spiritual encampment handed out flyers at the Vallejo Farmers Market. Over the past week, thousands of “Stop the Desecration of Glen Cove” flyers have been distributed throughout Vallejo and the greater Bay Area. A printable PDF of the updated version of this flyer is available here. This Saturday the 28th, a workshop on the United Nations Declaration on the Rights of Indigenous Peoples will be held at Sogorea Te between 2-4pm. Morning Star (Pit River) and Mark Anquoe (Kiowa) of the International Indian Treaty Council will be hosting the workshop, and Mark Anquoe will be giving a report-back from the 10th session of the the U.N. Permanent Forum on Indigenous Issues that he participated in earlier this month. A know-your-rights and legal observation training will also be held at Sogorea Te on Saturday from 12-1:30pm, hosted by volunteers from the National Lawyers Guild. Those supporters who plan on standing with us in the event of an emergency are encouraged to attend this training. Also this Saturday the 28th, Morning Star Gali (Pit River) will speak in support of Glen Cove at the annual African Liberation Day event in Oakland: 12pm at the Per Ankh Praise House – 959 33rd Street (at San Pablo). Bless you and all you do! I can’t come tomorrow but I will be out there Sunday! Y’all are still in my prayers thanks for the hospitality and love!!!! !